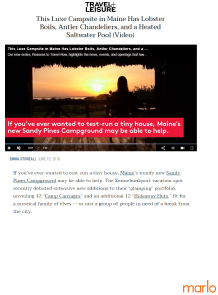 Boston and New York public relations agency marlo marketing secured a Travel + Leisure feature on Sandy Pines Campground in Kennebunkport, ME as a result of careful media mailer recipient selection and meaningful follow-up. The article spotlights the client’s new glamping accommodations, key differentiators and includes quotes from co-founder Tim Harrington. The piece was also shared across Travel + Leisure’s social platforms including Facebook, Instagram and Twitter.